On a multi-monitor computer setup, the visibility of shortcut arrows are ignored. This happens regardless of the shortcut arrows preference chosen within Fences. Only on the primary monitor is the shortcut arrow preferences always respected. On any other secondary monitor, the shortcut arrows are hidden after a desktop refresh or computer restart. This can easily be reproduced by populating a Fence with shortcuts on a secondary monitor. Right-click to refresh the desktop and the shortcut arrows will now be hidden. Then drag this particular Fence to the primary monitor and suddenly the shortcut arrows will be visible. This is all done with a normal Fence, not a Folder Portal. Excellent, thank you. I am available to provide any other details if needed. I can't seem to reproduce your issue on my dual monitor setup. When ever I disable "hide shortcut" the shortcut appear. When I do refresh, it still stay visible. Note: the screen shot below is from my secondary monitor. Make sure to re-download the latest version from your account. Install it. Reboot and test it. Report back. Thank you for looking into this issue. After purging Fences the shortcut arrows are still not visible on secondary monitors (only the primary monitor), so it seems that this is an issue with Windows. I'll have to look into this some more, which is weird considering it's a totally fresh install of Windows 10.
it will help to see if there is conflicting applicaitons with fences. I performed all of the cleanboot steps under a new Window's Administrator account and the shortcut arrows still remain hidden on secondary monitors. Although I did uncover something interesting. I went on my coworkers computer (which Fences has never been installed) and the shortcut arrows are hidden on secondary monitors. So it seems like this is a setting built into Windows 10 - Build 17134. I've eliminated Fences as the culprit to this problem by checking on a different Windows 10 computer which has never had Fences installed. 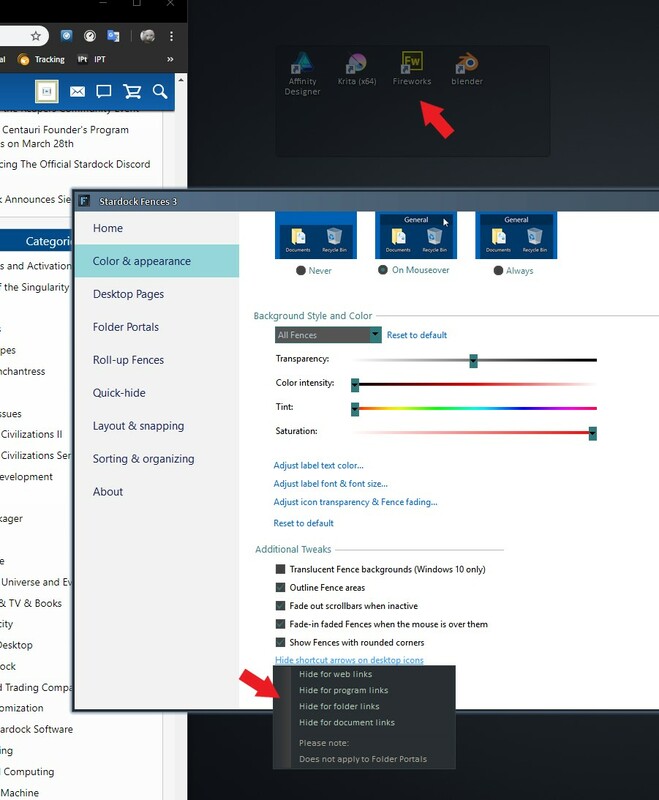 To reproduce this issue: On a 3 monitor setup, right-click to refresh the desktop and the shortcut arrows will now be hidden on secondary monitors. Drag any shortcut to the primary monitor and suddenly the shortcut arrow will be visible for this individual shortcut. I've hunted high and low for a solution, but it doesn't seems like an obvious Windows 10 setting that I'm missing. Hard to believe that it's a Windows 10 (Build 17134) bug, but it's possible.